The American Drag Racing League (ADRL) concluded its 2012 season with its annual Racer Appreciation and Awards Gala at the Champion's Club at the Texas Motorplex on Sunday, one day after it completed the World Finals VIII presented by CarSafe. World champions in every class were honored, a list that includes Mick Snyder (Pro Extreme), Bob Rahaim (Pro Nitrous), Alan Pittman (Mickey Thompson Extreme 10.5), Eric McKinney (Pro Extreme Motorcycle), Cary Goforth (Extreme Pro Stock), Mike Castellana (Aeromotive Fuel Systems Pro Modified), Marco Abruzzi (Summit Racing Equipment Top Sportsman) and Alexander Oppen (Pro Junior Dragster). 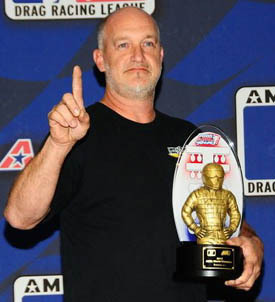 The ADRL also announced its special award winners, naming PXM's McKinney its 2012 Driver of the Year, Extreme Pro Stock standout Todd Hoerner its 2012 Rookie of the Year and zMAX Dragway in Charlotte, the host of Dragstock IX, its 2012 Track of the Years. 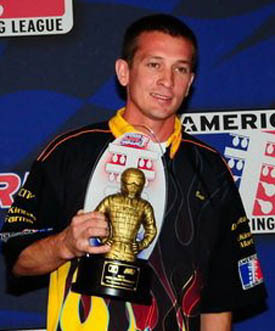 Snyder, the 2010 ADRL Rookie of the Year, continued to show tremendous progress in Pro Extreme, winning his first ADRL championship. He won three straight races early in the year, held the points lead for most of the season and also became the first driver in the class to run in the 3.50s in 2012. In the end, he also held off teammate Jason Scruggs, advancing to the semifinals at the World Finals to be crowned champion. "Everybody's car is running better and everybody is figuring it out. It's pretty awesome to see how quick and how fast these cars are going now. It's pretty amazing when you think about it," Snyder said. "You keep looking at the progress and it's pretty dang exciting. To end up on top in a class like this just pretty unbelievable and just a tribute to all the people on this team." 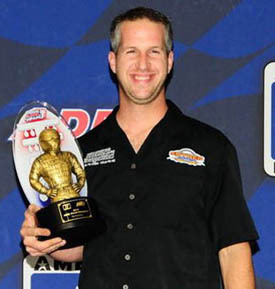 Bob Rahaim's dream season concluded with a 2012 world championship in Pro Nitrous, giving the Michigan native his first ADRL world title. 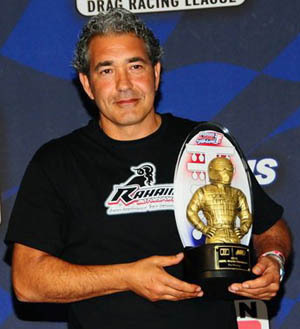 After advancing to back-to-back finals to start the season, Rahaim took control over the summer, winning his first ADRL race at the Summer Drags VIII in July. He then turned in a pair of clutch performances in September, winning back-to-back races to put him in position for the title. With a huge gathering of friends and family, Rahaim officially clinched the world title in Dallas. "I get goose bumps just thinking about this and I just have to thank the ADRL for giving us such a great place to race," Rahaim said. "This is our second season together for this team and it's been so satisfying to see it all come together. For me, it's just something that I've always wanted to have happen. To find the right group of people, it's just amazing and I owe a lot to them. Everyone brings something to the table and it's all clicked. It's just been an amazing year." 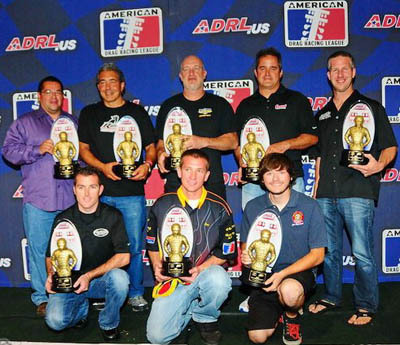 McKinney entered 2012 with championship hopes, but it turned into much more than that during one of the most dominant seasons in ADRL history. McKinney won his first race of the season in May at Maple Grove Raceway, but really turned it on down the stretch, winning the final five events of the year, including Saturday's World Finals. Overall, he finished with seven wins and nine finals appearances, running as quick as 4.02 in a thoroughly magnificent season. "This whole team is incredible. If it wasn't for them I wouldn't be here. They definitely work their tails off, and that makes me more comfortable on the bike, and that's what it's all about," McKinney said. "When we come to race, we're here for one reason and we do everything we can to win, but we could have never imagined having a year like this. It's incredible and it is just overwhelming." Goforth finished a remarkable two-year run with a second straight world championship, putting him with elite company in the process. 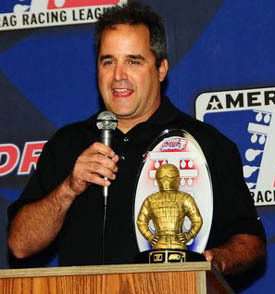 Goforth, the 2011 ADRL Driver of the Year, officially clinched the 2012 championship with a win at the World Finals on Saturday, giving him three wins in 2012 and a class-best nine in his marvelous career. He joins Jason Scruggs and Mike Castellana as the only drivers to win back-to-back championships in the ADRL. "To do this for a second straight year and get another championship is just a special thing and I can't begin to describe how happy I am," Goforth said. "This is a great class and the competition is just something else. These drivers pushed me to the limit all year, and I'm just thankful for my dad (Dean), an awesome team and just a great crew. It's the greatest team I've ever been on and that made the difference." The greatest season in Alan Pittman's racing career started with two wins in Mickey Thompson Extreme 10.5, giving him a points lead he would never relinquish. He finished with three wins during a standout season, also running as quick as 3.80 to give Pittman the second quickest run in the history of the class. He won his first world championship while also developing a strong friendship with the Leggett family. "This is the first world championship that I've ever won, so this is definitely very special to me," Pittman said. "I've got to thank Greta and Terry Leggett for giving me the opportunity to race this car, and the ADRL for giving me a place to race. "It's been a dream season and I couldn't be happier with how it has gone." Castellana posted a remarkable come from behind win to capture his second straight ADRL championship after winning a world title in Pro Nitrous a year ago. This time, Castellana needed a brilliant performance at the World Finals to get the championship. He did just that, running a pair of 3.85s to win the race and clinch another world championship. Castellana and the Al-Anabi Racing team finished with five wins in 2012, pushing his career total to an impressive 14. 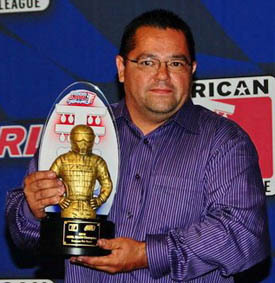 He also joins Scruggs and Goforth as the only two-time world champions in the ADRL. "Shannon and the crew did an amazing job with the car, and I just have to thank Sheikh Khalid (Al-Thani) for supporting us," Castellana said after winning the World Finals VIII presented by CarSafe on Saturday. "Winning five events is just awesome and shows what this team can do. It's a great moment for all of us and it's been another exciting year." Just like the incredible racing in the class, the points championship race in Summit Racing Equipment Top Sportsman came down to the wire. Marco Abruzzi, William Brown III and Ronnie Davis battled for most of the season, but it was Abruzzi who finished less than a round ahead of Brown to claim the first world championship in the class. Abruzzi became the first driver in class history to earn two wins and displayed remarkable consistency for the majority of the season. "I really think this is one the best classes around and I was really excited to see the ADRL bring it in," Abruzzi said. "This is some of the best sportsman racing you will ever see and it means a lot to be the first one to win the championship in this class. "I also have to thank Summit Racing Equipment for not only sponsoring me, but also the class. They've really put a lot of support into the class and this has just been a great year." 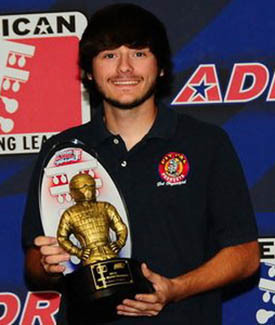 In his final year racing in the ADRL's Pro Junior Dragster class, Alexander Oppen competed at all 10 events and earned his first ADRL world championship. "This is just a great award and I really have to thank my dad (Larry) for making the big sacrifice and taking me to every race. I also have to thank Mickey Thompson for helping me out. It was just a thrill to compete and win the championship this year," Oppen said.